Courtesy of BBC Pictures we can now see the new Tardis interior and console which will first feature in The Snowmen to be shown on Christmas day. i must say, it has grown on me. very dark and mysterious. I Love the new look TARDIS. I think Verity Lambert would be pleased and amazed to see project to be still be on today, celebrating 50 years this November. I dont really like this tardis. i wish they had keeped it the same like before. But hey,dont listen to me, Im only 10! Doctor Who was ‘good’ long befour 2005. The new Tardis is a mixture of classic consoles and new ones, which is an important thing to have for the 50th. Seems too organised,stark and characterless. “I preferred it the way it was”. The clutter and randomness of the previous two summed up both the TARDIS and The Doctor’s characters sublimely . It could do with a touch of moodiness about it. However, “everything changes” and being able to adapt is the reason why all of us can keep talking about the programme after all these years. Best go now,sit in a mood filled room and be childish.Works for me! I’ll have to agree with Caro, it seems like a really cold, clinical kind of Tardis with no personality, also, I miss the different floors of the old model. Moffat, what have you done??? I think it looks really cool apart from the spinning bit at the top of the room. It looks like the classic tardis inside from 1970s! …and yes, I admit, there are some of his compositions that I really like in the show. However, I just think it’s time for him to move on to something else. I’d like to hear someone who can compose somthin a little more subtle, ethereal, and otherwordly for the show. Because Benjee10, incidental music means “accompanying, but not a major part of something”…like I said he’s a telented musician, but he is far from subtle. The last thing Doctor Who needs is the constant onslaught of a full orchestra playing songs….incidental music is not about writing songs, it’s about composing parts and sections to cover scenes. I’d much rather hear certain parts of the show with no music, or just a handful of musicians playing a part. Murray’s music is so constantly bombastic and in your face. You shouldn’t immediately notice the music…it should enhance the scene. Murray seems to think that the show enhances the music. He writes songs and puts them whereever he wants to. It’s almost like he doesn’t even watch the show. Get over it, Murray Lovers! As far as the symphony goes, of course it would be enjoyable to watch an orchestra playing this stuff…it’s good music. Incidental Music it is NOT! If you want to hear how incidental music should sound, go watch Lost or Battlestar Galactica or 24, so you can hear how Michael Giacchino, Bear McCreary, and Sean Callery truly understand the show they’re composing for. You can argue all you want, but go back and watch Series 1 and 2, and you’ll see Murray’s music is bombastic and in-your-face and intrusive a lot of the time. I admit it’s a little better now, but that’s because Moffat told him to tone it down. You are right but I think you need to get used to it and any way you have to admit it looks more like a time travel machine. I like the new control room, it could use more roundels though. I would love to see the original Hartnell room realized in color as the designer intended. Ai? The new TARDIS is awesome! It feels to me like Doctor Who has become a new show! 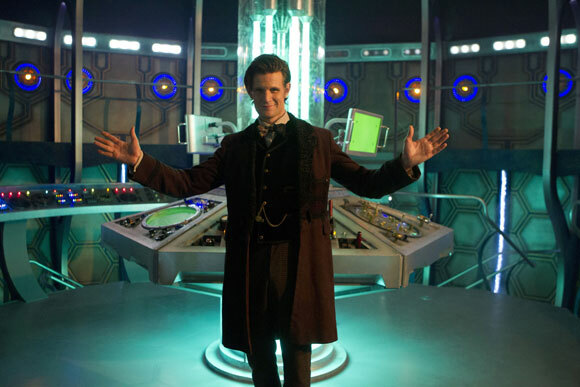 My criticism is the Console Room looks smaller compared to the Eleventh Doctor’s previous one? Kind of the point, considering this is the 50th anniversary and all. Finally became good? After 50 years?